As previously noted, I am always interested in identifying the maker of an attractive but anonymous mask. Sometimes the observed features are merely suggestive of a particular hand, while other details seem to contradict that attribution. On further study, incremental clues may accumulate to a point where the identity of a particular mask’s carver becomes suddenly obvious, or this same accumulation may overturn one’s earlier impressions. In today’s post I will discuss four beautiful Yaqui Pascola masks from my collection that have obvious age, remarkable wear, and mystifying features. I imagine that they date to the 1940s or 1950s, but of course I have only limited data to support this impression. Whether you share my obsession about attribution or not, I am sure that you will be charmed by these masks. I have pestered my friend Tom Kolaz about these masks and their features for more than a decade. Tom’s response seems like a good place to begin. He notes that these masks are old enough to have been repainted, perhaps more than once, and so some of the features that they have in common may reflect the hand of a later painter rather than that of the original carver. Such a situation might mitigate against my hope to identify the carvers. I acknowledge the validity of his perspective. Nevertheless, because these masks are so beautiful, they haunt me. Here is one of them. 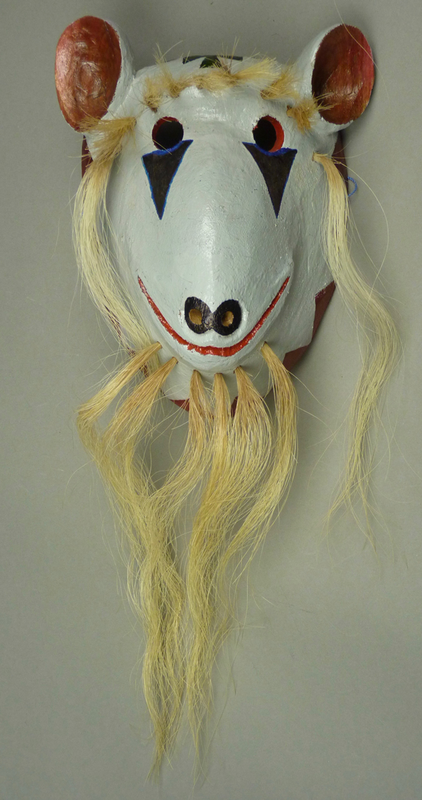 I bought this mask from Fred Huntington, a Tucson Indian Arts dealer, in about 1995. Today I will show some more unusual masks that were carved by Crisencio Molina Maldonado, and then one of his necklaces, which are worn by Pascola and Deer dancers. I will begin with this Mouse faced mask. In 2007 Tom Kolaz told me that Crisencio had a friend in Potam, Sonora, a Pascola dancer whose nickname was “Mouse,” so Crisencio decided to make a mask with a mouse face for that dancer. The friend liked this mask and wore it as a Pascola. Both Tom and I found this a charming story, and so Tom asked Crisencio to make copies of that design for us. Crisencio delivered this one for me about two years later. The ears are most artfully carved. Today we will look at seven masks by Crisencio Molina Maldonado that were carved in a small size that would be appropriate for children. The backs of these masks are unremarkable, and by now you have seen many examples of Crisencio’s manner of carving the backs, so I omitted photos of the backs of these children’s masks.The first, which was collected from the carver in 2004, portrays a parrot. There is no forehead cross. 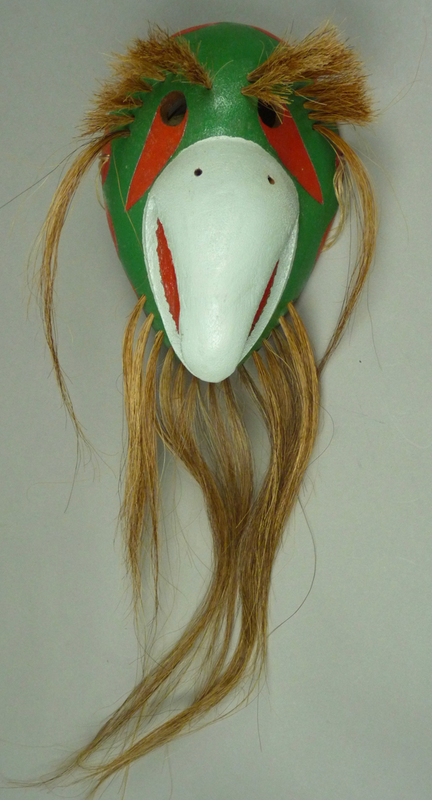 Today we are going to look at bird masks by Crisencio, beginning with a Rooster and a Hen that date to 2004. Here is the Rooster. There is no forehead cross and no place for a cross. I collected my first mask by Crisencio Molina Maldonado from Tom Kolaz in 1994, fully a decade before either of us had any idea of this carver’s identity or ability. 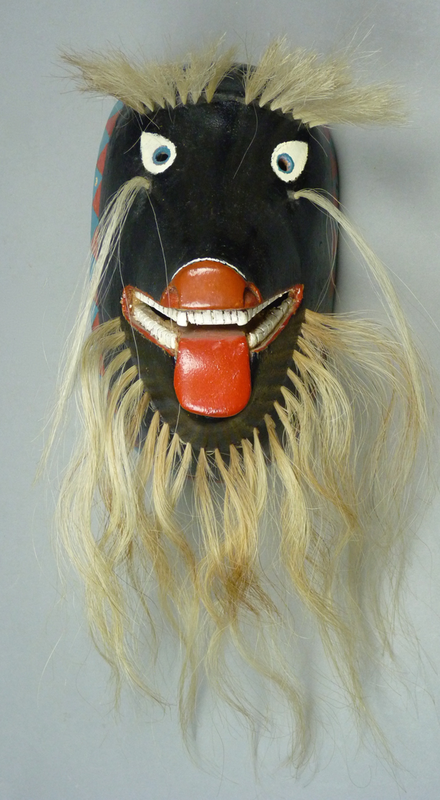 Briefly, Tom purchased this Canine mask from a Yaqui “Moro” (dance troupe manager) after it had been danced in a cultural demonstration in Litchfield Arizona (outside of Phoenix) in January 1994. Because the mask had not actually been used in a formal ceremonial setting, but yet it was danced by a traditional Yaqui dancer, it fell into an unusual category. Tom offered to sell it to me because he knew of my interest in masks that were specifically carved to order for child performers. The mask had been carved by a Potam maker, “Maldonado Molina,” in 1993. Many years later it occurred to me that this was a mask by Crisencio. This mask does have some design details that we have encountered in later masks by Crisencio. 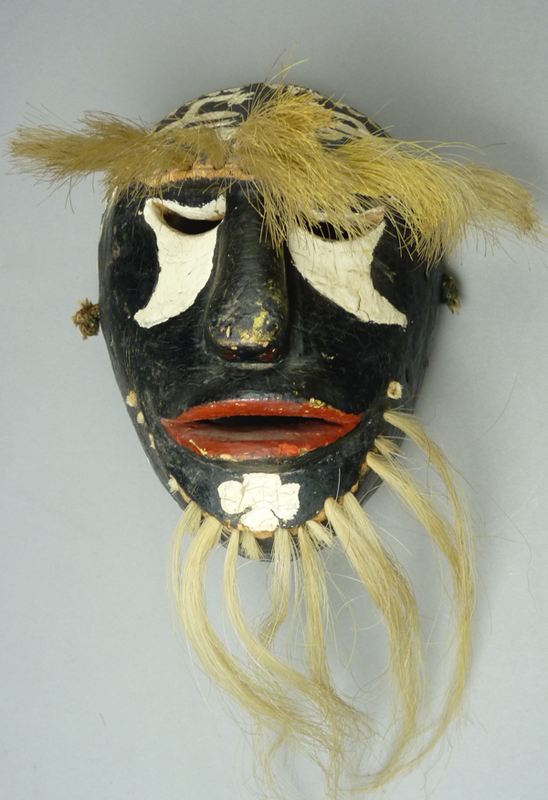 For example, the quality of the hair on this mask is very fine, with 23 tufts around the chin. The absence of any cross is a variable feature for this carver, as you will see in the masks that follow. Furthermore he likes extended tongues.